You won’t find a quicker, easier way to make the perfect fudge than with this recipe from Eagle Brand. So creamy, with just the right amount of sweetness. I like to add walnuts for that added crunch. Line a 9-inch pan with aluminum foil, leaving a 1 to 2 inch overhang. Butter the foil. Melt chocolate chips with sweetened condensed milk and salt in a heavy saucepan over medium low heat. Remove from heat; stir in vanilla and nuts. Spread evenly in prepared pan. Chill for 1 to 2 hours or until firm. Remove from pan by lifting edges of foil; remove foil and cut into squares. Store is a tightly covered container. 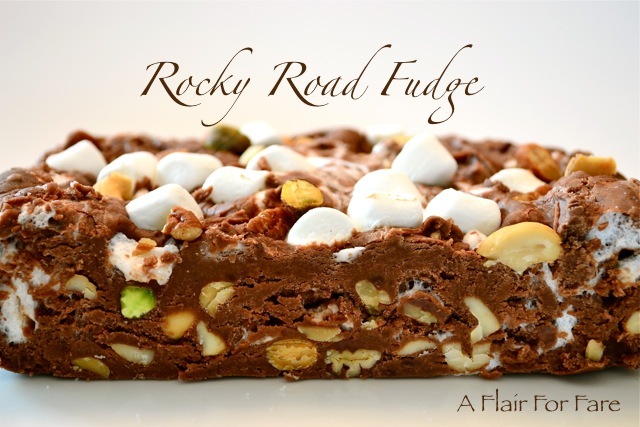 Every Christmas I make a batch or two of that reliable old favorite Never Fail Fudge recipe. I can’t imagine how many pounds of this sweet concoction I have given away. It’s so easy and comes out perfect every time. This year I decided to make it a little more interesting, adding mini marshmallows and a mixture of my favorite nut variety to create my version of this popular holiday treat. Line an 11 x 7 baking dish with aluminum foil, extending foil over the edges of the dish. Lightly butter foil and set aside. In a medium (3 Quart) heavy bottomed sauce pan, combine sugar, butter, evaporated milk, marshmallow fluff and salt. Stir over low heat until blended. Bring mixture to a low boil over medium high heat, stirring constantly for 5 minutes. Remove saucepan from heat, add vanilla and chocolate chips. Stir until smooth. Stir in nuts and mini marshmallows. Quickly pour into prepared dish, spread evenly and cool. When fudge has set, lift out of baking dish and cut into squares. Here’s a quick and easy fun treat, just in time for Halloween! Line a cookie sheet with wax paper or parchment. Add chocolate chips and oil to a small microwaveable bowl or coffee mug. Melt in the microwave at 30 second intervals until mixture is smooth. Insert lollipop stick into marshmallows. Dip marshmallows in melted chocolate letting excess chocolate drip off. 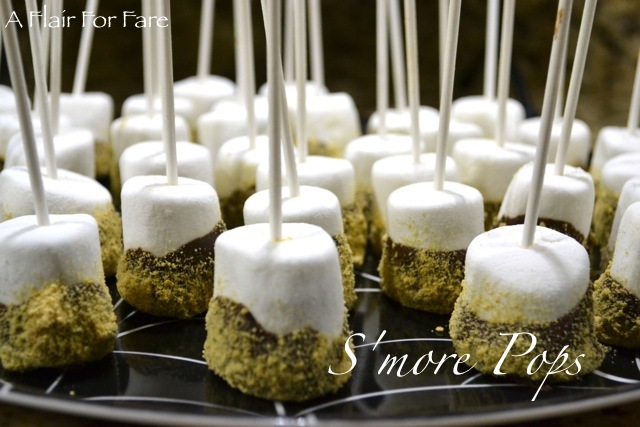 Quickly dip marshmallows in crushed graham crackers and place on lined cookie sheet. Place cookie sheet in refrigerator for 15-30 minutes, until chocolate has set.